I'm writing this as I listen to Frank Turner play a live show at Wembley Arena. That would be unremarkable if the show were available in Apple's Music app (it's not). Instead, I'm listening to the audio portion of a YouTube video with Ulysses full screen on my iPad. In a little while, I'll take a break for dinner and AirPlay the rest of the concert audio while I eat. That's not possible with the YouTube app unless you pay for a YouTube Red subscription, but it is with ProTube, a highly-customizable YouTube client by indie developer Jonas Gessner that lets you enjoy YouTube on your own terms. The YouTube app isn't bad, it's just made with an average user in mind. There aren't many ways to customize it. You watch videos the way YouTube decided they should be watched. ProTube takes the opposite approach putting users in control, which makes it perfect for YouTube power users and anyone who has ever been frustrated by the one-size-fits-all approach of the YouTube app. One major draw of ProTube is that it has no ads. There's no need to watch the same handful of ads over and over or wait for the 'Skip Ad' button to appear. For some people, ProTube as an ad blocker for YouTube is probably reason enough to use the app, though it's just the tip of the iceberg when it comes to what ProTube can do. 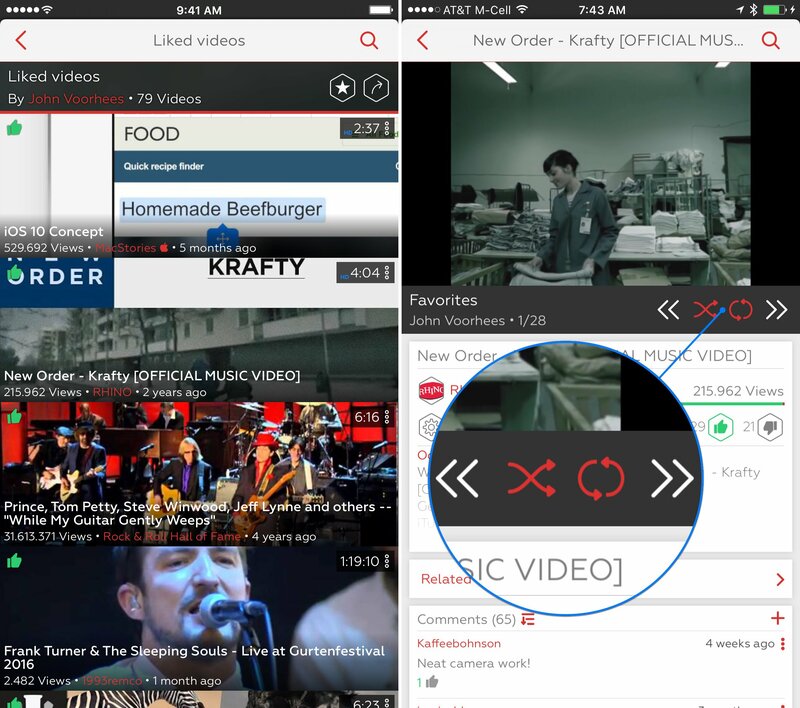 You can peek and pop videos in ProTube, adjust resolution and playback speed, and build playlists. ProTube also has fine-grained control over the resolution of the videos you watch that goes beyond what is available in the YouTube app. In the settings you can specify different playback resolutions for WiFi and cellular data to avoid burning through data too quickly when you are away from WiFi. If you're running iOS 10 you can also play 1080 videos at 60 fps or watch 1440 and 4K resolution videos, none of which is available in the YouTube app. ProTube also lets you control playback speed and remembers the speed you were on when you return to a video you paused. With playlists, you can turn ProTube into a sort of music streaming service because it can play 256 Kbps audio without displaying video. Just set up a playlist of music videos you like and play them in audio mode. Playlists can be set to repeat the whole playlist or just one video, just like you can do with any music app. ProTube also supports audio playback while you work in another app, which the YouTube app doesn't do without a YouTube Red subscription and is how I played the Frank Turner concert while writing this. Playlists can be used to stream music without video and include shuffle and repeat controls. Playlists don't require a Google account. In fact, you can also rate videos and share videos without a Google account if you prefer. You do need to sign into a Google account to subscribe to channels though. One of my favorite touches in ProTube is that you can pick which section of the app you want it to start in. The default is Popular, but I set ProTube to start in Subscriptions because there is rarely anything that appeals to me in the Popular section. Instead, I like to check my subscriptions for new material and occasionally browse the What To Watch section, which I've found more likely to turn up something worth my time. Search is also a good way to find videos because the results returned by ProTube can be sorted by four categories with a total of 18 different options. ProTube has true iOS PIP, supports the system share sheet, and audio can be played whether you are in ProTube or not. Sharing is also superior in ProTube. Instead of being limited to a handful of choices, ProTube lets you access the system share sheet, greatly expanding sharing options. In addition, there is a URL scheme for incorporating ProTube into automation apps like Workflow, Launch Center Pro, and Drafts. One drawback of ProTube is that while its design is modern, it’s a little busy at times. Any view that shows a series of videos is comprised of rectangular thumbnail stills pulled from each video. As you scroll, there is a parallax effect that makes the thumbnails pop off the screen a little. The trouble is that a random assortment of video stills overlaid with controls and labels can be hard to read. One other quibble I have with ProTube is that I had to sign into my Google account twice, once after tapping the Sign In button in the sidebar and a second time to import my subscriptions. There may be a good reason why ProTube works this way, but it's a hassle if you have a long password and two-factor authentication turned on. 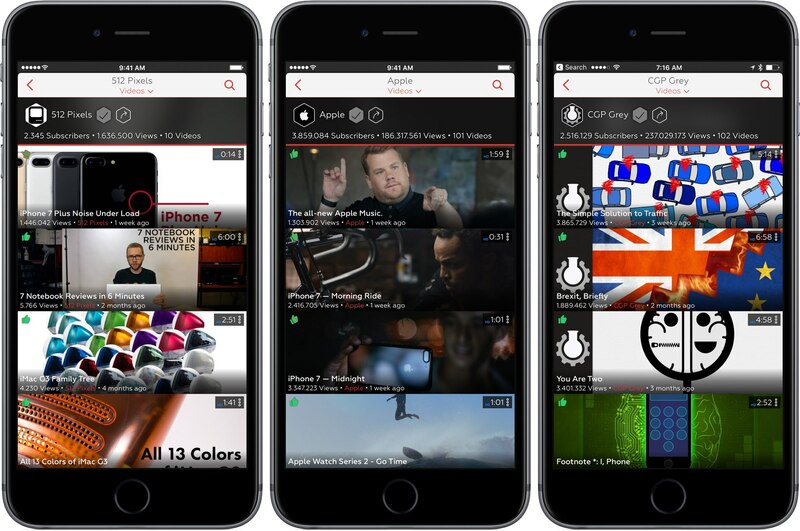 For a flat price, ProTube offers many of the same features that are only available with a paid YouTube Red subscription. You can't download videos for watching offline or get exclusive content with ProTube, but unless those things are important to you, ProTube is an economical alternative to YouTube Red at just $2.99. That combined with the ability to fine tune how you watch YouTube videos and true picture-in-picture support on the iPad also makes ProTube an excellent choice for anyone who is frustrated by the YouTube app. ProTube is available on the App Store for $2.99.